I really like pork tenderloin. It's relatively inexpensive, easy to cook, and a good, lean source of protein. Furthermore, it's basically a blank canvas for however you want to season or flavor it! 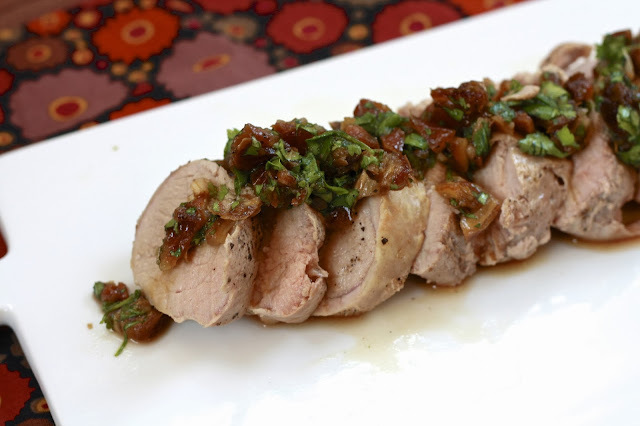 Previously our favorite pork tenderloin was this bourbon-marinated one that is grilled. While that's still near the top of the list, I think the fact that I've now made this particular recipe twice in the last month speaks for itself! Ingredients and process wise, it couldn't be easier. The pork doesn't need to be marinated. Rather, you sear it in a pan on the stovetop, then transfer it to the oven to bake. Pan drippings are added to the relish, which is a simple combination of orange juice, dates, and cilantro that's just bursting with flavor. This is certainly 'fancy' enough to serve to company, despite how easy it is. I'll admit, however, that both times I've made it, it's been just Ryan and I, and we were perfectly okay with not having to share the leftovers! Bon Appetit hit a home run with this tenderloin recipe, and you're sure to impress whoever you serve it to! 1. Preheat oven to 425F. Heat 1 tbsp olive oil in a large skillet over medium-high heat. Season pork with salt and pepper and cook, turning, until browned on all sides (6-8 minutes). 2. 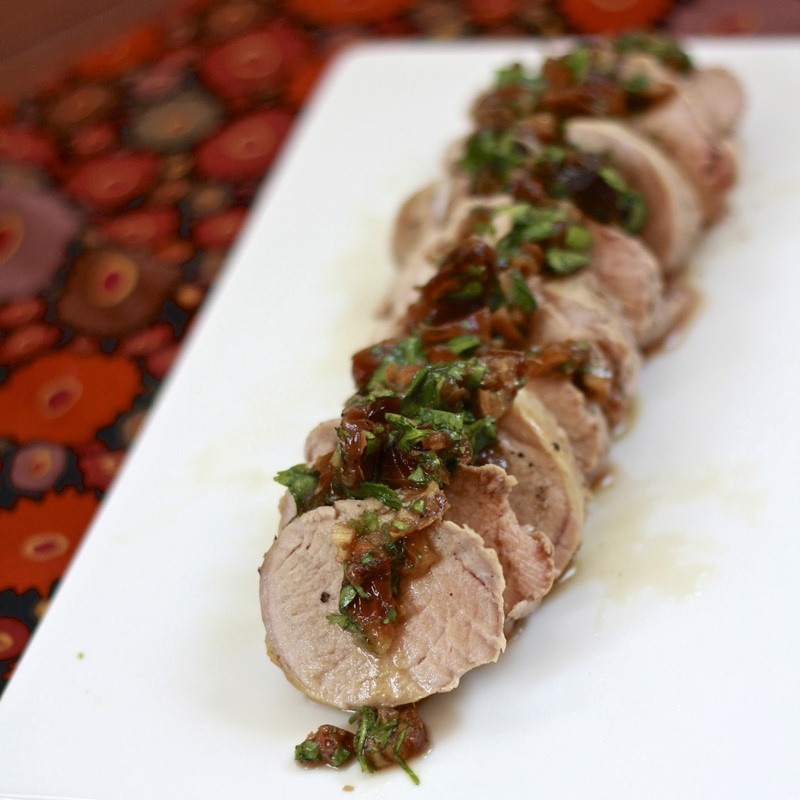 Transfer pork to an oven-safe dish and cook pork until an instant-read thermometer inserted in the thickest part of the pork reads 140F (10-15 minutes). Transfer pork to a cutting board and allow to rest at least 5 minutes before slicing. Set aside pan drippings. 3. Toss dates, orange juice, reserved pan drippings, cilantro, and remaining 2 tbsp olive oil in a small bowl. Season with salt and pepper. 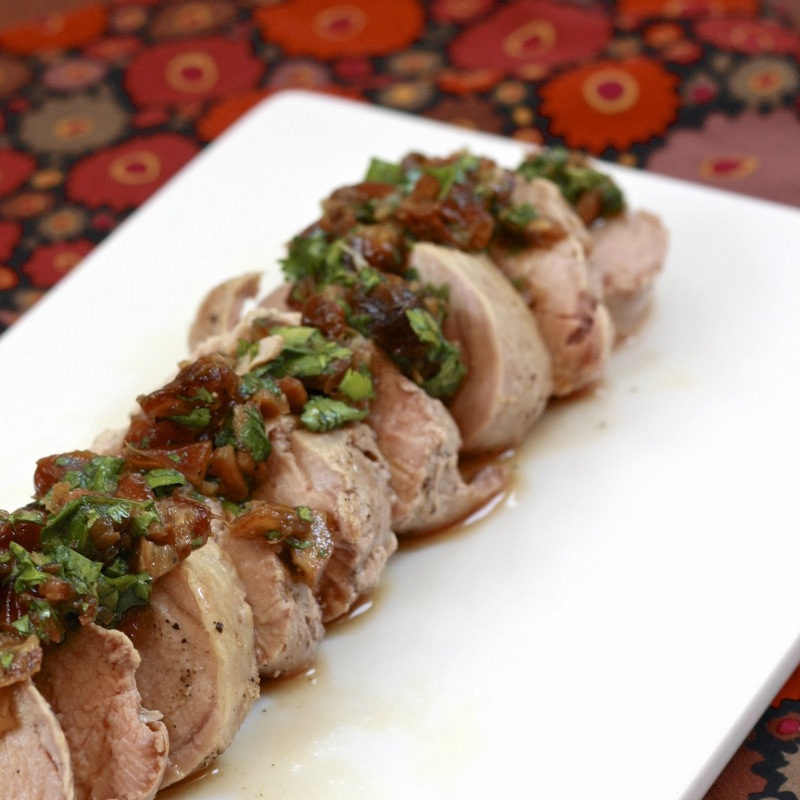 Spoon relish over pork and top with additional cilantro, if desired.